Use the Glue effect to repair the cracks that appear between joints during animation. • Left Port (Matte): Receives the matte. • Middle Port (Port A): Receives the element that will not be used to fill the joint. • Right Port (Port B): Receives the element that will be used to fill the joint. 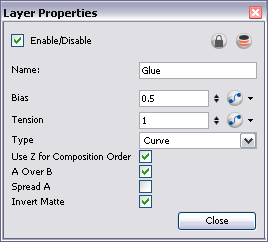 For most effects with the Glue module, the default options are sufficient. However, you can modify these options using the Glue editor. • Bias: Indicates the tendency to favour the static or moving element. Set to 0, it favours element A; set to 1 it favours element B; set to 0.5 it is in between A and B. • Tension: Indicates how tight the joint will be. Set to 1, the tension has no effect; set less than 1, the tension decreases; set greater than 1, the tension increases. • Type: From this menu, select the type of joint to create. You can choose from among Curve (default), Line and Corner. • Use Z for Composition Order: You can use this option to choose the drawing with the higher front-back value to create the joint. • A Over B: Indicates which image is rendered on top in the final image. 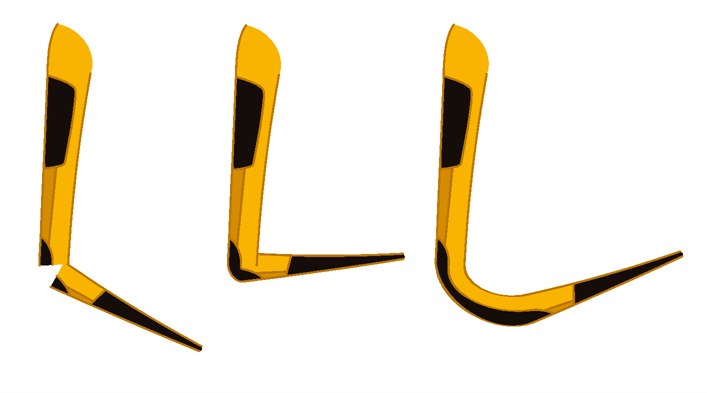 By default, A is rendered on top of B, which indicates that the image in the middle port (A) is rendered on top of the image in the right port (B). • Spread A: By default, the image in port B is spread to fill the joint. You can use this option to choose the image in the A port to create the joint. If you select this option, the drawing module must receive position information from the "B" element. Thus, you must connect the Drawing module of the "B" element to the Drawing module of the matte. • Invert Matte: Activate this option to invert the matte used to fill the joint. If you want to use the "B" element as the matte, you must select this element.